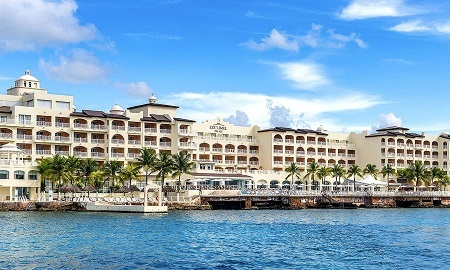 Luxury All Inclusive Cozumel Palace Resort in Cozumel, Mexico! Bid Per Person Per Night & Choose Your Length of Stay! No long ago, Cozumel Island was revealed to the world with all its charm. Now adventure travelers and nature lovers are discovering Cozumel Palace, a stunning resort bathed by the blue waters of the Caribbean Sea. It's the ideal getaway for all ages and perfect for diverse, snorkelers, and those seeking an island vacation. Experience how luxurious accommodations and adventurous fun can come together for the vacation of a lifetime. Make a splash by sharing your favorite activities with someone you love, or plan an enchanting destination wedding. Explore the world-famous Palancar Reef, located just steps away from your guest room. Enjoy close proximity to downtown San Miguel and the ferry pier to Playa del Carmen. 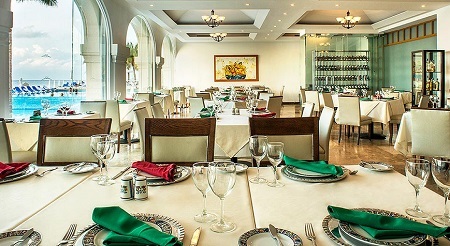 Welcome to a world of yum—savor Italian, Pan-Asian, and Mexican entrees at four different restaurants at Cozumel Palace. Dine on your schedule, according to your mood. There is a variety of options always available to satisfy your cravings, including balmy outdoor dining areas, elegantly laid back indoor restaurants, and more formal options for romance and magic. Accent your meals with a bevvy of top shelf wines and beverages including unlimited wine by the bottle from wineries in Spain, Argentina, California, France, Italy, Chile, and Mexico. Explore the breathtaking reefs and exotic sea life that make the Mexican Caribbean one of the finest areas to scuba dive. 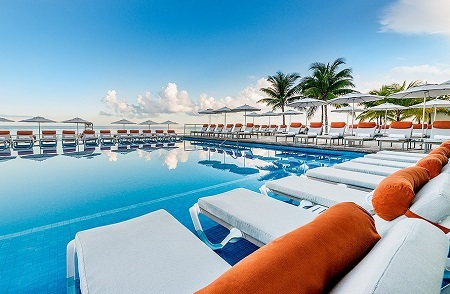 This elegant and intimate resort is a water lover’s paradise—all 169 luxurious suites look out into the pristine waters of the Caribbean Ocean. Guest room options include Junior Suite, Concierge Level and Loft Suites. Each suite boasts a spacious seating area and a double whirlpool tub ideal for relaxing after a day of exploring. 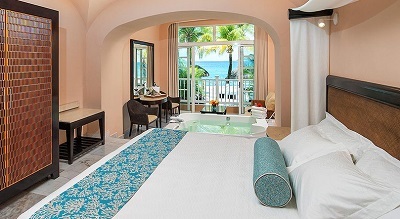 You can also savor the crisp ocean breezes of the Caribbean waters from your own balcony. Offer is based on a Double Occupancy in a Ocean View Suite. The Ocean View Suites offer a stunning ocean view from the 1st & 2nd floors. These rooms are a sanctuary of breezy elegance and comfort replete with either 1 King or 2 double beds, an intimate seating area, a double whirlpool tub, a complimentary bottle of wine, a private bath with shower only, and, in most rooms, a balcony fitted with a hammock. Max Occupancy: 4 guests including children & infants. Upgrade to a Ocean Front Suite for an additional + $10.oo per person per night. The Ocean Front Suites offer a breathtaking ocean view from the 3st & 4nd floors. These spacious rooms are boast either 1 King or 2 double beds, an intimate seating area, a double whirlpool tub, a complimentary bottle of wine, a private bath with shower only, and, in all rooms, a balcony fitted with a hammock. Upgrade to a Concierge Level for an additional + $25.oo per person per night. Start each day with the breathtaking beauty of a Caribbean Ocean view from your personal balcony. Welcome to Concierge Level luxury. Boasting all luxurious amenities as the Junior Suites offer, the Concierge Level also features upgraded mini bar spirit options for your enjoyment. Upgrade to a Loft Suite for an additional + $35.oo per person per night. Enjoy two levels of boundless luxury with a Loft Suite. The lower level boasts a bedroom with a king-sized bed, double whirlpool tub and private bath with shower. The upper level features a with bedroom with double beds, a private bath with shower. Step out on the balcony and ease into the hammock to enjoying the breeze breeze in from the ocean, or lounge around in the living room. Max Occupancy: 4 adults and 2 children (6 guests). 827.3 Sq. Ft. Single Supplement: Offer is based on double occupancy but a single supplement of $175 per night is available for those traveling solo. Stay a minimum of 1 night or up to 21 nights as desired and based on availability. Tax and service charges of $49.oo per person per night additional.